Kolessa, Oleksander [Колесса, Олександер], b 24 April 1867 in Khodovychi, Stryi county, Galicia, d 23 May 1945 in Prague. Linguist, literary historian, ethnographer, and civic leader; brother of Filaret Kolessa. In 1895 he was appointed lecturer and in 1898 professor at Lviv University. 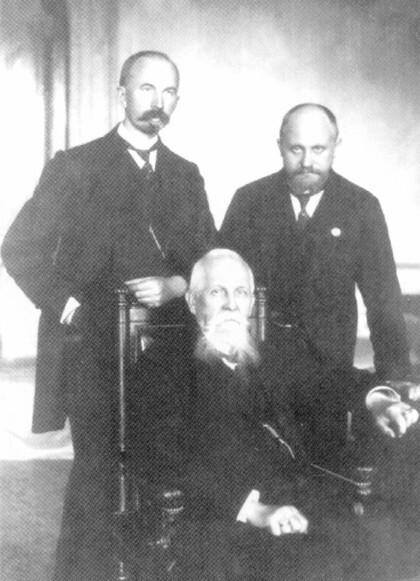 In 1899 he was elected a full member of the Shevchenko Scientific Society. 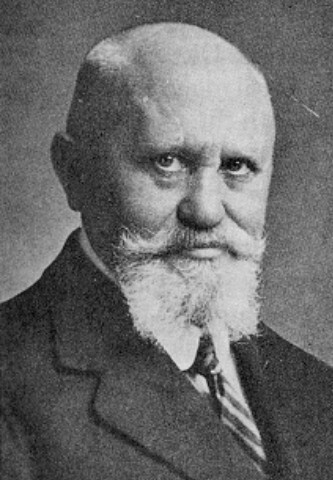 As a member of the Austrian Parliament in 1907 and from 1911 to 1918, he defended the educational rights of Ukrainians, including the right to have a Ukrainian university. He was one of the founders in 1915 and the vice-president of the Ukrainian Cultural Council in Vienna, which organized Ukrainian émigré schools. From 1921 he headed the Western Ukrainian National Republic's diplomatic mission to Rome. He was a central figure in émigré scholarly life in Prague: organizer, professor, and rector (1921–2, 1925–8, 1935–7) of the Ukrainian Free University; a founder and vice-president (1923–32) of the Ukrainian Historical-Philological Society; and first president (1924) of the Ukrainian Academic Committee. From 1926 to 1939 he was also a professor at Prague University, and from 1929 a member of the Slavic Institute in Prague. Kolessa belonged to Franz Miklosich's linguistic school. He investigated old Ukrainian paleography, historical phonology, and morphology particularly in the Horodyshche Apostolos and the Horodyshche Gospel, the Uzhhorod polustav, and the life of Saint Sava. From the study of the last (1896) he drew some important generalizations about the distinctive characteristics of old Ukrainian texts in relation to old Russian texts. 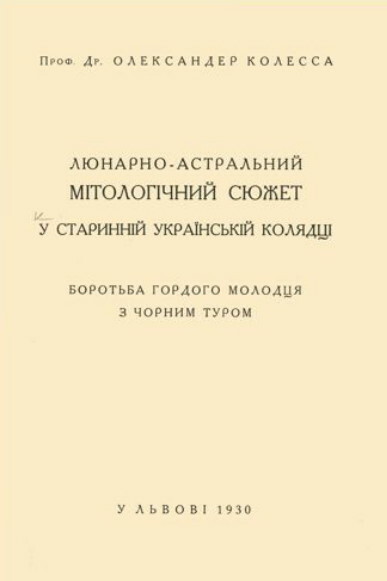 In his Pohliad na istoriiu ukraïns’koï movy (A View of the History of the Ukrainian Language, 1924) he gave a general survey of the history of the Ukrainian language. As a literary scholar he studied Ukrainian-Polish literary relations (he wrote articles on Ukrainian folk songs in the poetry of Józef Bohdan Zaleski and on Adam Mickiewicz's influence on Taras Shevchenko). He is the author of studies of Yurii Fedkovych (1893). He also wrote about the genesis of the modern Ukrainian novella (1924). His Pohliad na suchasnyi stan istorychnykh rozslidiv ukraïns’ko-rus’koï literatury, Naidavnishyi peryod: Kil’ka probliem i deziderativ (A View on the Present State of Historical Research on Ukrainian-Ruthenian Literature; The Earliest Period: Several Problems and Desiderata, 1901) summarizes his general views. In the field of folklore studies he contributed Holovni napriamy i metody v rozslidakh ukraïns’koho fol’kl’oru (The Main Directions and Methods in the Study of Ukrainian Folklore, 1927) and articles on apocrypha and solar and lunar motifs in Ukrainian Christmas carols.